DO YOU KNOW HOW TO READ THE LABEL OF OLIVE OIL? It is important to know how to correctly read and interpret the labels of foods and thus be more rigorous with what we eat, since sometimes they can cause confusion. What information can we find in the labeling of olive oil? How is it regulated? In this post we will make clear of all these topics. 1. 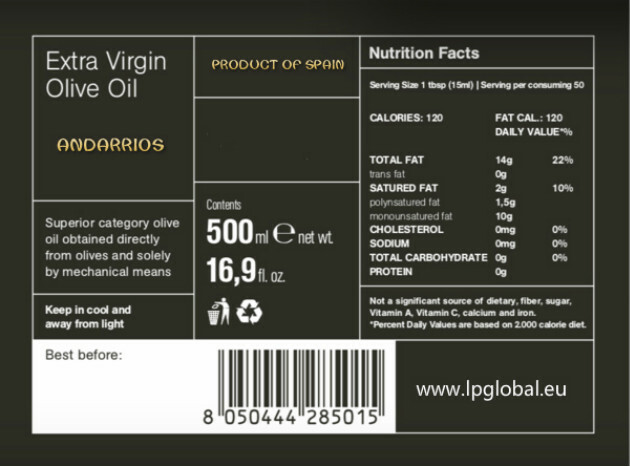 Product category: We will go deeper into another post about the differences between each category of oil, since it depends on many factors, but it is important to know that VIRGEN EXTRA olive oil is of the highest quality, since it retains all the properties nutritional and beneficial for health, as well as an optimal taste and smell. Even so, there are other possible categories such as VIRGEN olive oil, olive oil or olive-pomace oil, depending on the extraction method and the degree of acidity. 2. Designation of origin. This indicates a geographical name where the oil has been made and where the olives have been harvested. 3. Date of minimum duration: That is not the same as expiration date. When a label says, 'consume preferably before ...', as in the case of oil, it means that after that date the product no longer offers the full quality it should offer. It may have lost some of its organoleptic qualities (smell, taste ...) or not be entirely satisfactory due to oxidation, but it does not mean that it has expired since this would imply that once the date is exceeded the product could cause damage to our health. All olive oils must have the date of preferential consumption on the label, and this is usually one year after the harvest generally. 4. Mandatory nutrition information: According to Regulation (EU) No 1169/2011, it is mandatory to include certain nutritional information in the olive oil container, specifically the energy value (Kcal) and 6 nutrients (Total fat, Saturated fat, Hydrates of carbon, sugar, protein and salt). The labels must show the information for every 100 grams or milligrams and the quantities per serving can be added voluntarily. 5. Special storage conditions: This section describes how to properly store olive oil, normally in a cold, fresh and dry place ... to maintain its organoleptic properties to the maximum. 6. Name or business name, as well as the address of the food business operator: It is not mandatory to state the manufacturer of a product, although many oils include in their labeling references such as 'manufactured by' 'packed by'; etc to provide more information. 7. Optional labeling of olive oils: In this section you can put characteristics of each olive oil, for example, if you had the 'first cold pressure' or 'cold extraction'. Also some characteristic of the flavor and the smell of the oil: intense, medium, light, balanced, sweet ... and the indication of the acidity. To conclude, comment that a Spanish olive oil supplier can only present to the final consumer packages of five liters maximum, having to incorporate an opening system that loses its integrity after its first use and that is non-refillable when it is intended for consumption in hospitality industry.